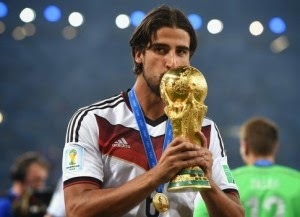 Reports are out claiming that Arsenal’s move for Real Madrid midfielder Sami Khedira is stalling over personal terms. The Mirror reported that Gunners boss Arsene Wenger wants to make the £23.5million Germany superstar his second major signing of the window following the £33m capture of Alexis Sanchez last week. But, even though Khedira has just a year left on his contract at Real Madrid, the Gunners are not willing to be held to ransom by his demands for £150,000-a-week before bonuses. The salary would lift the 27-year-old – who has so far rejected a new deal at the European champions – above the likes of Sanchez and Mesut Ozil, both of whom are on around £130,000-a-week.